I'm an Evernote junkie .... there, I've said it. Yes, I admit it. I tell EVERYBODY about it; talk with ANYONE who knows me and they'll tell you I've at least mentioned Evernote to them a some point. My desk is clean. I have NO MORE post it notes. I no longer use my paper-based filing cabinet. No scraps of paper. No notes lying around .... they've all been scanned into Evernote and DISCARDED. Best of all .... ALL of the above is readily accessible to me wherever I am .... it's "in the cloud" .... on my computer, on anyone else's computer, on my iPhone, on my iPad. It's completely ubiquitous. A video overview of the tool -- this is definitely worth watching and will give you the basics. Click here to watch the video (approximately 12 minutes, but again, well worth the time). THE BEST BOOK written on the subject, Evernote Essentials -- Click here for more info on the book. Give it a try .... or IF you're already using it, watch the video and read the book for tons of GREAT ideas for how to fully leverage this amazing tool. In his book "Getting Things Done," David Allen talks about the power of the "Two Minute Rule" as it applies to our productivity and keeping our heads empty of all the little things we need to do. The concept is simple: If you have a task to do -- a email that you just received, responding to a voice mail message, dealing with something that has landed on your desk, etc. and it can DEFINITELY be done in two minutes or less, then go ahead and DO IT. NOT doing it, means writing it down or putting it on a task list or trying to keep track of it in your head. By the time we do get around to doing it, we've probably spent MORE than two minutes processing it FOR completion. Is there something magic about two minutes -- could it be a one minute rule or a three minute rule? Certainly, but the message is this: If it can be done quickly, go ahead and do it. Determine what "quickly" means for you, but something in the one to three minute range is probably best, otherwise the time accumulates and you run the risk of counter-productivity. IDEA: Pick a 10 or 15-minute block of time, twice each day, and handle a series of two-minute tasks. You'll be surprised at how much you get done by the end of the week. So....What do you have in front of you RIGHT NOW that can be done in two minutes or less? Gail Geary, J.D., CMC, is the owner of Atlanta Career Transition, an international career transition and outplacement firm, and is also a career management consultant for Right Management Consultants. She is a front-line correspondent working with individual career changers and major corporations. Gail has also been on the adjunct faculty for the American Management Association and three Atlanta-area universities. Jonathan Fields, author of Career Renegade: How to Make a Great Living Doing what You Love, is profiled in this weeks WorkLife Nation webisode. It’s timely because the intersection of career, happiness and productivity is the meat of debate lately. Even amidst our “career chaos economy,” some corporate loyalists are going renegade, seeking a more fulfilled working experience. For some it’s meant giving up the big bucks for a bit – or switching careers. The definition of “career” is being deconstructed. The traditional life-long or 9-5 job is changing its face for a lot of reasons: we’re living in an ever-changing economy due to globalization, the internet has upped the entrepreneurial game, rough economic conditions have sparked innovation, and the desire to be treated like human beings at work and in business - is stronger than ever before. With the chaos over the last year has come plenty of opportunity. New business niches are being revealed as we change the way we work. The internet, technology, telecommuting, and a desire for a better work life fit have fueled innovation and fed a new stream of entrepreneurs. These changes have even stirred up the work life balance debate in corporate America. Jonathan Fields talks about his journey, in this weeks WorkLife Nation webisode. Original article from Judy Martin HERE. Michael Watkins, author of the books, The First 90 Days and Your Next Move - A Leader's Guide to Successfully Navigating Major Career Transitions, is interviewed on the Harvard Business Review YouTube Channel on the subject of successfully navigating major career transitions. Getting clarity on BOTH of the above is key to navigating and realizing a successful career transition. What are some things I really do well, that I probably need to drop or no longer do in the new position? What are some things that I DON'T do well, that are going to be important elements in the new position -- and therefore important for me to improve upon? The world is changing; OUR world is changing and the pace of change continues to increase. What matters NOW, is THINKING BIG and undertaking small actions -- baby steps, if you will, -- on a day-to-day basis focused on making those big things HAPPEN. It all begins with new ideas and new ways of thinking. I recently came across an excellent (free) eBook assembled under the direction of one of my favorite pundits, Seth Godin. According to Seth .... "Now, more than ever, we need to shake things up. Now, more than ever, we need a different way of thinking, a useful way to focus and the energy to turn the game around." I completely agree with Seth, and the eBook he has assembled is full of wonderful, inspiring ideas to help you make big things happen in YOUR world -- your business, your personal life, your community. More than seventy big thinkers have contributed to this amazing eBook, each sharing an idea for you to think about as you head into the new year. Here's the deal: it's free. Download it here. Seth's big goal is to get this free eBook in the hands of 5 million people. You can find an easy to use version on Scribd as well. Please share with anyone in your world whom you care about. Let's watch the magic happen together! Most senior executives have never faced the prospect of prolonged unemployment. Add to that a hyper-competitive job market and the realities of not generating income for the foreseeable future, and we all tend to get overwhelmed. So....you're in transition, now what? Wouldn't it be nice to have a concise, easy-to-read guide that could get you started off on the right foot and maybe even shorten your path back to steady income? Good news! Such a guide has been commissioned and is available for FREE as an e-book entitled "I'm In Transition, Now What? 12 Ways to Shorten Your Unemployment by 90 Days." This e-book is comprised of 12 powerful ways to shorten your transition by 90 days. It's chock-full of useful tips on networking, resume writing, interviewing, social media, and much more from career experts across the country. The e-book will be a living document, meaning new chapters will be added based on reader feedback. We hope you'll take some time to read the e-book and share your feedback. We also highly recommend you send this e-book to your professional network, or anybody that might need a fresh career perspective, as a way to spread the wealth. They'll thank you for it! You can access the e-book here: I'm in Transition, Now What? All the best to your Career Success! Andy Robinson, Carrie Robinson - contributing authors, "I'm in Transition, Now What?" Interview with Frances Cole Jones, Author of "The Wow Factor - The 33 Things You Must (and Must Not) Do to Guarantee Your Edge in Today's Business World)"
Carrie and I interviewed author Frances Cole Jones on the Career Success Radio Show on Tuesday, November 10th on the subject of "Wowing" and positively influencing your colleagues, employers, potential employers -- even your competitors. Frances recently released her newest book, "The Wow Factor" with offers easy-to-follow advice and immediately implementable tips and techniques for "Wowing" those around you. CLICK HERE to listen. Frances founded Cole Media Management in 1997. From the beginning, the company’s focus has been to cultivate a client’s inherent strengths to develop more powerful communication skills and, through these, enhance his or her personal and professional performance. Cole Media Management clients have appeared on The Today Show, Good Morning America, Oprah, C-SPAN, CNN, Squawkbox, The Charlie Rose Show, Larry King Live, The Discovery Channel, The BBC News, E! Entertainment, Access Hollywood, Project Runway, Top Chef, ESPN, Extra! Fox and Friends, The View, Cashin’ In, QVC and others. Clients' print interviews have appeared in publications including The Wall Street Journal, The New York Times, Forbes, Newsweek, Vogue, W, O Magazine, Town & Country, Harper's Bazaar, Tatler, etc. The scope of their work includes preparation for television and print interviews, IPO road shows, meetings with potential investors, and internal meetings with partners, sales staff, and in-house personnel. They also provide presentation skills seminars and speechwriting for clients. I recently read Beverly Kaye's and Sharon Jordan-Evan's excellent book, "Love It Don't Leave It - 26 Ways to Get What You Want at Work." Beverly and Sharon share 26 great ideas for how to find what is RIGHT about your job and how to make the most of your work environment. This book is particularly timely in today's job market, but is equally relevant regardless of the unemployment rate and state of the economy. "Love It Don't Leave It" is definitely a MUST READ for anyone who wants to TAKE CONTROL of their performance and their careers. All of the ideas are highly practical and IMMEDIATELY implementable. Too many people leave their jobs because something is wrong or something is missing. They either leave physically -- by walking out the door; or, they leave "mentally" by withdrawing their energy and commitment but stay put -- later regretting their departure (either way). But....there ARE other options. It is possible to achieve and regain love and passion for your work -- It is possible for YOU to create all of the following where you are now. NOW is the time to take control; pick up the book and take action -- the ideas are presented in a manner that facilitates implementation -- the processes are clearly presented. Join us next week, Tuesday, November 3rd, at 4pm EST on Exceptional Wisdom Radio, when we interview Sharon on her book and she talks about some of the 26 ways to "fix" you current work situation. All of the following books are chock-full of great insights, excellent tips and offer innovate and highly practical ideas directed toward your professional development, career planning and management, and achievement of success (as you define it). The recurring theme in all of these books is that each of us must take personal responsibility for our own situation and discipline ourselves to take the actions necessary to continue to advance our career. Take a quick look at all five and choose one that really "hits home" with your current situation and your near term career goals and objectives. I highly recommend all of them and hope you gain some useful insights that you can put into action. 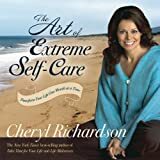 This book by author Cheryl Richardson offers you 12 strategies to transform your life one month at a time. Designed as a practical, action-oriented program, each chapter challenges you to alter one behavior that keeps getting you in trouble. Great leaders know how to lead by example and create trust. With this book, Noah St. John gives you a simple, proven way to become a true leader, both in your family and your professional life. For those fearful of the next headcount reduction, Viscusi offers a sound strategy for "surviving" and remaining a valuable team member. The 50 tactics he offers are intended to bulletproof a job, but they are also the same tactics that make one a valuable employee and enhance one's attractiveness to prospective headhunters. An informative guide to walking away from an established-albeit stultifying-job and forging a more rewarding career. A multitude of questionnaires, exercises and worksheets helps readers determine their dream job, assess expenses and assets, and plot an escape plan to break free of corporate life. The book also provides pointers to those readers who simply want to be happier in their current job.